Continuing its strategy to arm mobile professionals with tools that make them more productive, BlackBerry Limited (NASDAQ:BBRY)(TSX:BB), a global leader in mobile communications, today launched the BlackBerry® Passport. Featuring a large square touch screen and new QWERTY touch-enabled keyboard, the BlackBerry Passport is a device purpose-built for productivity-driven business professionals who want a smartphone that empowers them with the mobile tools they need to get things done, without sacrificing style or portability. "As we set out to design BlackBerry Passport, we were guided by a simple yet challenging idea - to set aside the limitations of traditional design and to instead simply build a device that fundamentally changes the way business professionals get work done on their smartphone," said John Chen, Executive Chairman and CEO at BlackBerry. "The BlackBerry Passport was created to drive productivity and to break through the sea of rectangular-screen, all-touch devices." The large square screen is optimized for viewing and creating content, and will make everyday tasks like reading and writing emails, reviewing and editing documents, web browsing, and map navigation, more comfortable and effortless. The BlackBerry Passport includes the industry's first touch-enabled keyboard with gestures that make typing, editing and navigating more efficient and accurate. BlackBerry's physical QWERTY keyboards have always made it easier for users to create polished, professional communications with exceptional accuracy. BlackBerry Passport's new QWERTY keyboard is almost four times more accurate than BlackBerry® 10 virtual keyboards - the error rate is on average 74% lower - so there are fewer typos to get in the way of what you're trying to say. 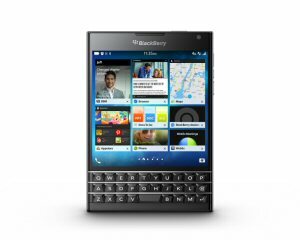 The BlackBerry Passport along with Porsche Design P'9983 smartphone from BlackBerry®, are the first devices to launch on BlackBerry's latest OS platform, BlackBerry® 10.3. They come preloaded with new productivity-enhancing features including BlackBerry® Blend and BlackBerry® Assistant, as well as the BlackBerry® World™ storefront and Amazon Appstore, offering access to the very best apps for work and play. BlackBerry Blend brings messaging and content that is on your BlackBerry smartphone to your computer and tablet. Get instant message notifications, read and respond to your work and personal email, BBM™ or text messages, and access your documents, calendar, contacts and media in real time on whatever device you are on, powered by your BlackBerry. BlackBerry Blend is being introduced on the BlackBerry Passport and will work across desktop operating systems, including Mac OS X 10.7 +, Windows® 7+ and Android™ tablets running Android 4.4+ via cellular, USB or Wi-Fi connections. BlackBerry is also working to bring the Blend experience on other tablets soon. The downloadable version of BlackBerry Blend for Macs and PCs is available today at www.BlackBerry.com/Blend, on the Apple® App Store(SM)for iPad tablets, or via the Google Play™ Store for Android tablets. Large High-Resolution Square Screen - The BlackBerry Passport includes a 4.5" square screen with a 1:1 aspect ratio, 1440x1440 pixel (453 dpi) HD display and Corning® Gorilla® Glass 3 for added strength. Innovative BlackBerry® Keyboard - The BlackBerry Passport's revolutionary new keyboard brings innovation to input with a responsive touch surface like a trackpad that lets you perform many touch functions directly on the keyboard. You can scroll web pages, flick to type or slide along the keys to move the cursor, leaving the full screen space for viewing. BlackBerry® 10 OS 10.3 - The BlackBerry Passport comes preloaded with the new BlackBerry 10.3 operating system, including new features such as BlackBerry Assistant, BlackBerry Blend and Amazon Appstore. It has a fresh look that incorporates updated icons and an instant action bar so that each user's most commonly accessed functions are in the center of their screen. BlackBerry® World - BlackBerry World showcases essential productivity apps for business professionals looking to drive efficient communications and collaboration. Amazon Appstore - Preloaded on BlackBerry Passport, users can access popular consumer apps through the Amazon Appstore, including the latest Android games and apps, such as Minecraft - Pocket Edition, Candy Crush Saga, Pinterest, Temple Run 2 and Cut the Rope 2. BlackBerry® Assistant - The BlackBerry Assistant is BlackBerry's first digital assistant and can be used with voice and text commands to help users manage work and personal email, contacts, calendar and other native BlackBerry 10 applications. BlackBerry Assistant intelligently determines how to respond to you based on how you interact with it - if you type, it responds silently, if you speak, it speaks back and if you activate over Bluetooth, it speaks back with additional context because it assumes you might not have access to the screen. Premium Components - The device is built for the most demanding user using durable materials mixed with top-of-the-line technology, including a Quad Core 2.2 GHZ Processor, 3 GB RAM, 13 MP OIS rear camera and 32 GB memory. The BlackBerry Passport is now available through local carriers around the world and online through ShopBlackBerry.com and Amazon.com. For more information about BlackBerry Passport, please visit www.BlackBerry.com/Passport. To learn more about BlackBerry Blend, please visit www.BlackBerry.com/Blend. On September 24, 2014, BlackBerry invited the world to 'work wide' with its new BlackBerry® Passport, which features a 4.5" square display and revolutionary, touch-enabled keyboard. (MARKETWIRE PHOTO/ BlackBerry Limited).